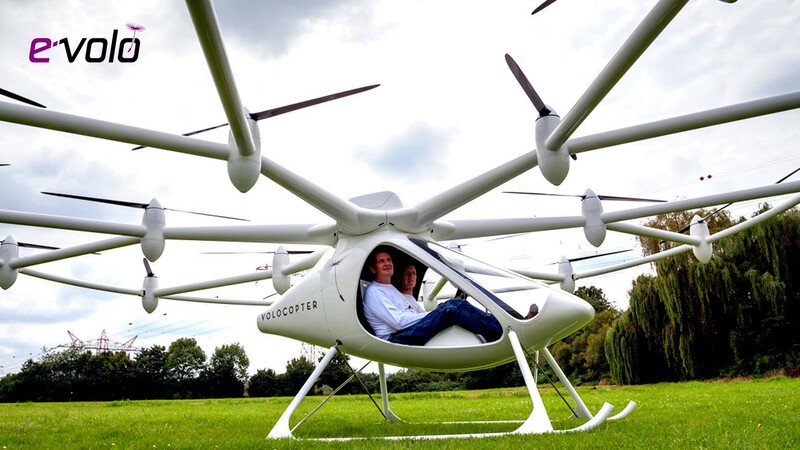 The Volocopter uses 18 rotors, which its inventors say make it ‘safer simpler and cleaner’ that current designs. Image source. 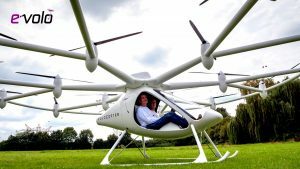 Developed by the German company e-volo, the Volocopter VC200, a 18-rotor rotor electric helicopter (aka multicopter) completed its first official manned test flight without a hitch, and documented the whole thing on camera. The video shows the managing director Alexander Zosel of the company of E-Volo piloting the maiden manned emission-free aircraft over an airfield in southern Germany. According to TechWorm, e-volo’s Volocopter is built from fiber composite material with a 450 kg (992 lb) take-off weight, and nine individual batteries power the all-electric motors and 18 rotors to make for a top speed of 100 km/h (62 mph). Best described as a drone-helicopter hybrid, the Volocopter has two seats available on it, while it runs on an electric engine with precision control being manned by a single joystick that is accompanied by a handful of buttons. Despite its complex shape and strange appearance, the Volocopter is designed to bring personal flight to the masses by being easy to fly. e-volo has tested its design with over 100 unmanned flights, but now that a human has actually piloted one, it’s on to a whole new round of testing. e-volo’s first test flight program saw the Volocopter hit speeds of 25 km/h (15 mph) at only low altitudes. The second phase will test the aircraft at speeds of 50 km/h and a medium altitude, with the final phase to raise that to higher altitudes and its top speed of 100 km/h. It may be a while before we see drone-helicopter hybrids like the Volocopter hovering overhead, but if it does happen, e-volo is keen to lead the way.